I love to read and I have really been getting into the Love Inspired books. Why? They are typically short, sweet, clean books - which makes for some good reading! Love Inspired sent me six of their new titles to read. They are also sponsoring a giveaway that one lucky reader will win a set of the same six books! How awesome is that! The Love Inspired product line is a series of 6 books that are released every month & only have a shelf-life of one month. 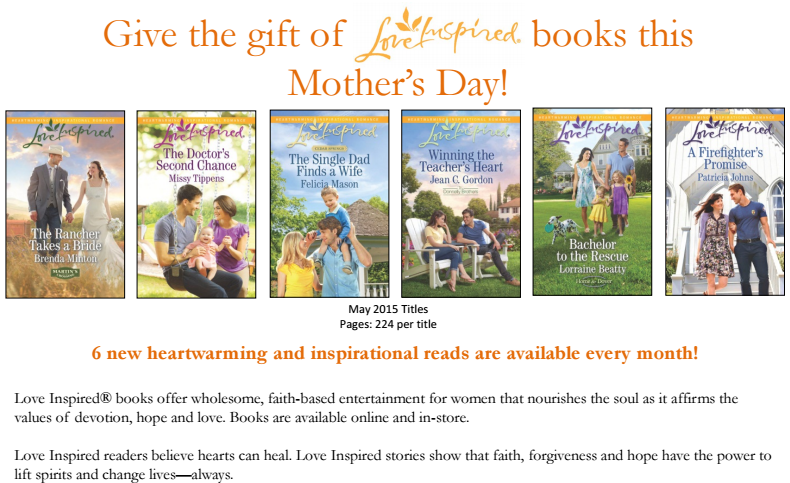 These books will be on sale April 21 - May 28 and will make the perfect Mother's Day Gift! 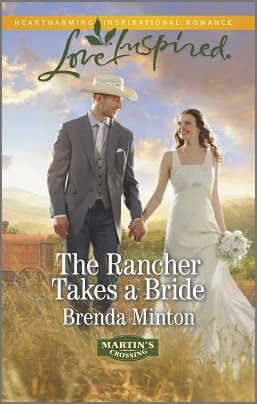 So far I have read The Rancher Takes a Bride by Brenda Minton. This story is about a single mom Oregon and her daughter Lilly. Oregon takes a chance and moves to the town of her daughter's father, with the intent to bring him into her child's life. She finds that opening her life can be filled with wonderful and unexpected moments and that just maybe her daughter wasn't the only one who needed more family in her life. I love how inspirational these books are. Characters have test of faith at times but find their way back to God. The stories typically romantic but always clean. I feel like they provide a nice little escape for a few hours of quiet time! Love Inspired has given me a $1 off coupon to share with you. Just click on this link to print your copy!! One lucky reader will win a set of six Love Inspired books! Love this series...they are clean to read and a sweet series. I haven't read this series yet, but it's one I've been wanting to read. Thank you for the chance to win the series!